While it’s important to stay on top of fundraising trends, it’s what you do with them that really matters. 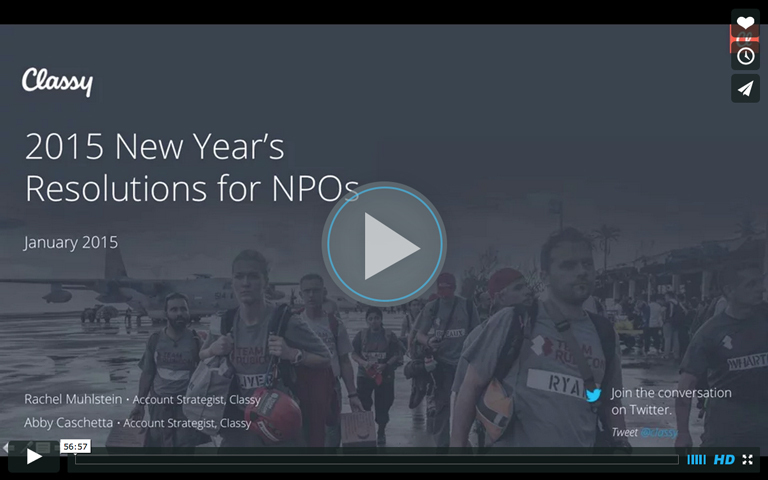 Recently, we hosted Part 1 of Classy’s Expert Webinar Series: 2015 New Year’s Resolutions for Nonprofits. In this webinar, the Classy Account Strategists—our in-house fundraising gurus—share best practices on how to achieve fundraising success in 2015. We cover top nonprofit trends and how to take your fundraising to the next level, complete with examples from nonprofits who are doing it well. To give you a sneak peak, here are three of our favorite takeaways, followed by a link to the full presentation. Fifty three percent of donors leave an organization because of poor communication practices. A unique way to improve your campaign communications is to plan it backwards. Before launching your campaign, for instance, you can think ahead and plan to create a sense of urgency around your end date. 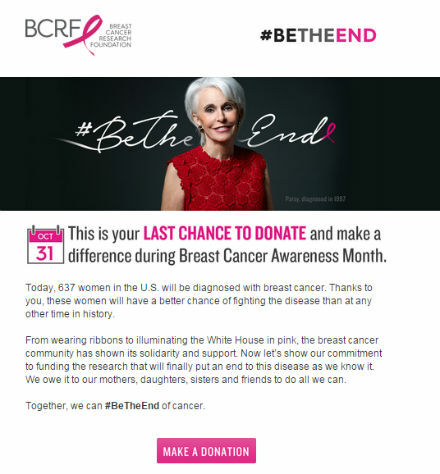 In this example, the Breast Cancer Research Foundation prepared a special email for the last day of their campaign, reminding donors it’s their “last chance” to lock in a donation. With some preliminary planning, organizations can push out these types of strategic communications that move people to action. Being active on social media can help build your online community, but you need an effective strategy to engage followers. Take, for example, the familiar campaign hashtag. While most organizations create a hashtag for their campaigns, many are often unclear about what supporters should do with it. At the beginning of your campaign, make sure to give a clear call to action so supporters know exactly what to do with your hashtag, and when. FEED Projects executed this strategy well during their recent #FEEDSupper campaign. Supporters hosted suppers where each guest made a donation to provide meals to those in need. From the onset of the campaign, the organization explicitly asked supporters to take a photo of their meals, upload it to Instagram, and tag it with the hashtag #FEEDSupper. These clear instructions boosted engagement, and the organization was able to collect dozens of uploaded photos through the hashtag. They then created an album of these photos and shared it on Facebook and Instagram, celebrating their supporters and all that they accomplished. What followed were a number of tips. One way to approach corporate partners is to pitch them the option to sponsor a donation matching period during your peer-to-peer fundraising campaign. To start, this allows businesses to stretch their dollar, allowing them to double the impact of their gift. At the same time, the donation match period exposes the sponsor’s brand to a broader audience. Using Classy’s corporate sponsorship feature, you can automatically display a sponsor’s logo on landing pages, donation receipts, and activity feeds whenever a gift is matched. This extensive brand promotion offers an attractive benefit to businesses, providing nonprofits a strategic way to secure corporate sponsorships. Our webinar is packed with more expert advice on how to craft a campaign checklist, create and empower your online fundraising community, improve your donor communications, and plan your key objectives for the New Year. Check out the entire presentation for more insights and insider tips.